On November 6th Dairy Queen Brantford hosted the annual United Way DQ Cupcake Day at both our King George Road and Colborne Street locations! We also had a 3rd week long outlet set up at Brantford’s Grand Wellness Centre on Grand River Avenue. This was our third year hosting this event and with the evolution of any event comes growth and more partners. For the second year, we were fortunate enough to have the Grand Wellness Centre as a partner and a 3rd outlet to encourage the community of our great city to support the United Way. How could anyone resist the taste of a Blizzard Cupcake?? 1. This year our staff made 112 packages of blizzard cupcakes. With 6 cupcakes in each package, that’s 672 Cupcakes purchased to help the United Way! 2. DQ Brant donated $7 from each package sold for a total $840.00. 3. The staff at The Grand Wellness Centre did an amazing job getting their customers involved and sold 46 packages at their location alone. On top of their excellent sales, The Grand Wellness Centre also donated $400.00. 4. Total funds raised for 2018 given to the United Way was $1240.00. Photo: Left to right. 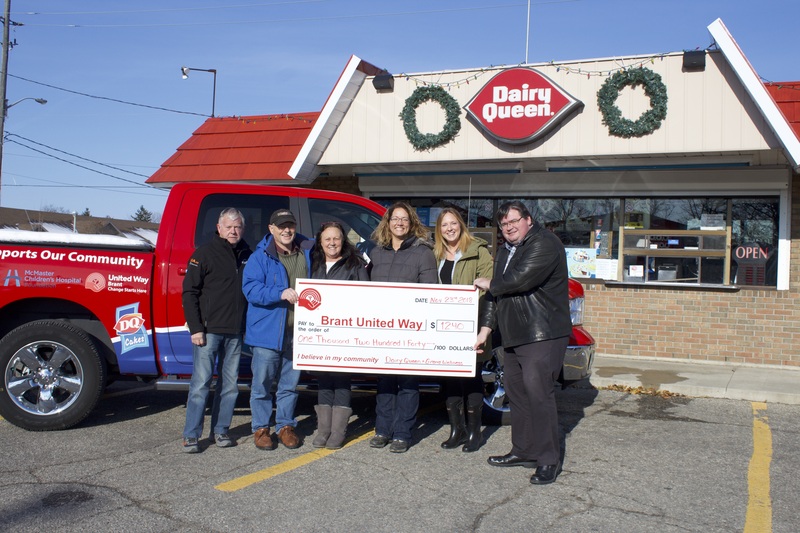 John Utley (Ward 2 Councillor), Ken Breau (Owner of DQ Brant), Tammy Breau (Owner of DQ Brant), Jola Westerhof (Co-owner Grand Wellness Centre), Rachel Child (Grand Wellness Facility Director), Dan Rankin (United Way Executive Director). Not present: Heidi Stewart-Petersen (Co-owner Grand Wellness Centre).